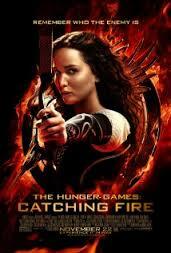 Last week I finally took the time to go and see the second movie instalment of The Hunger Games series, Catching Fire. Having heard how good it is all over the internet in blogs and reviews, You Tube, newspapers, TV shows, etc., I was swayed to go check it out. I’m usually put off by books and movies that are overhyped but this time my curiosity got the best of me. I felt the first film of The Hunger Games was all wrong and was sure that Catching Fire would be a disappointment too. Happily, I was wrong. They really seemed to put in a real effort to capture the spirit and meaning of the book, which wasn’t so much the case with The Hunger Games. As a matter of fact, Catching Fire the novel ,as I think back wasn’t really that captivating until the last quarter of the story. That’s the part when they go back into the arena. The rest of the book was just a lot of teenage angst and going backward and forward between the love triangle Katniss, Peeta, and Gale. Don’t ask me because I’m team nobody. I still believe that the majority of trilogies and series at the moment don’t always meet the criteria to be one. The stories often feel stretched beyond belief and grow stale way before the end. The Hunger Games trilogy was a valid trilogy, in essence, but it just seemed to be not as well executed as the story continued. The Hunger Games was really good although the writing at times was not as exact as it could have been. This is so awesome as the book was not a fav of the series for me and I was pleasantly surprised by how much I enjoyed the movie! Yeah so was I. I’m not a fan in general of YA for myself however I can understand why teenagers like to read them. I thought the movie was okay but found the idea of children killing each other worth digging into. Not sure I’ll pick up the books. Merry Christmas! That idea isn’t a new one. The books aren’t really that great. The first one is good but the other two get progressively worse. Happy holidays to you too! Yeah I read The Lottery. That’s Shirley Jackson. I liked it. Will check out your video Sounds yummy.. Hands down this movie was much better than the book. I liked the first film too, it wasn’t as good as the book but I still liked what they did with it to transfer it to the screen. I definitely agree with the point you made about some stories being made into trilogies that just shouldn’t be (the YA genre seems to be particularly afflicted). What’s this obsession with all new books, particularly ones with a supernatural or dystopian element coming in threes? Great post!